There’s the messy way to brew coffee, and there’s the Keurig way. Keurig specializes in single-serve home and commercial coffee machines. 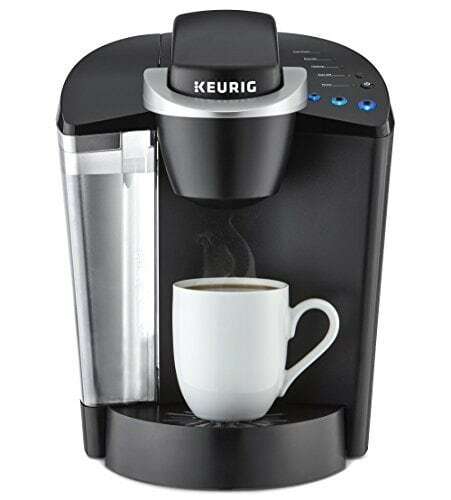 The K-Cup pod coffee makers from Keurig offer a fast, cheap, clean, and easy way to brew coffee. In fact, sophisticated models brew a cup of coffee in less than a minute. And, after brewing all you need to do is remove the used K-Cup. More importantly, commercial K-Cup coffee makers cost only a fraction of what commercial espresso machines do. But, if you’re not sure about K-Cup coffee, don’t worry. 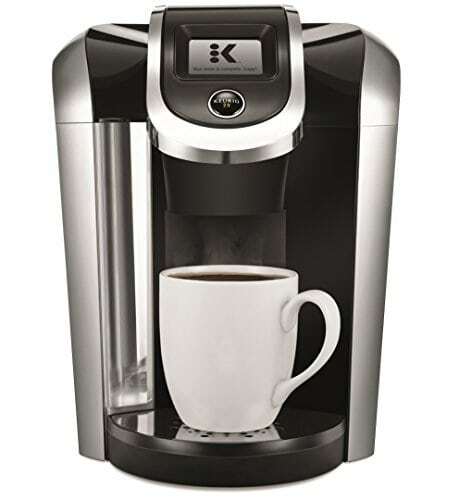 The entry barrier for this type of Keurig machines is less than $50. If you take a liking to the convenience of the system, you can buy one for your family, dorm, or office. So, are you curious to learn more about the best Keurig coffee maker for your needs? Great, let’s start exploring. We will begin the exploration with this section on Keurig coffee maker reviews. After reading this section, you will recognize the variety in capability and purpose of popular Keurig machines. In the section that follows, we will explain the important considerations relevant to buying the ideal K-Cup pod brewer for your situation and budget. Using the information in the two sections, you will be able to choose the best product for your needs from all the amazing products from this company. 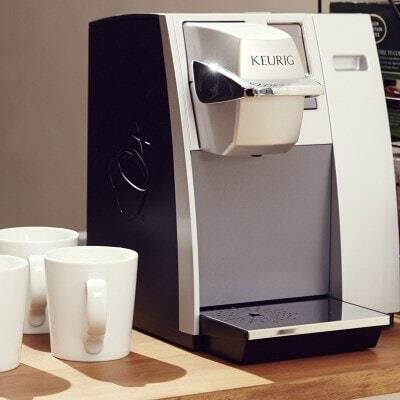 The Keurig K155 is a commercial brewing system built for small to medium offices. But, die hard coffee enthusiasts would love to have this machine at home as well. The major advantages of this product are its speed and performance. And, the most significant drawback of the machine is its price. So, let’s look at these factors in detail. After filling the 90-ounce reservoir, the K155 takes about 3 minutes to heat water. Once the water is up to 193° F, the machine is ready for brewing. Now, all you need to do is insert your favorite K-cup and select your cup size. Then, within 30 to 60 seconds, you will get a hot cup of flavored coffee. The K155 also lets you adjust the water temperature by ± 5° F. You can also program the available cup size, which are 4, 6, 8, and 10 ounces. The machine lets you feed the auto-shut off time. And, all the programmability features are accessible via a beautiful LCD display. However, this machine does not plumb to a water line. So, re-filling the reservoir is a bit of a hassle. For a commercial machine, it should have had that feature. But, the K155 is way cheaper and easier to use than commercial espresso machines are. In summary, the K155 is worth the price if you’re buying it for an office setup. For a personal K-cup machine, consider other options from Keurig. The Keurig K475 costs half as much as the K155 does. But, unlike the K155, which is a commercial brewer, the K475 is a better suited for home use. This brewer accepts K-cup, K-mug, and K-carafe pods. This allows you to prepare single-serve cups, mugs, or carafes. And, it also has a host of programmable settings. For instance, the K475 provides five temperature settings. This way, you can set the temperature high for milk drinks. And, if you’re drinking flavored black coffee, you can set the temperature higher. The machine also comes with auto-off, auto-on, and power saver functions. You can also choose cup sizes among 4, 6, 8, 10, and 12 ounces and carafe sizes among 22, 26, or 30 ounces. The display interface that allows you to access the programmable settings is easy to use and well laid out. However, the water reservoir is only 70 ounces and you cannot hook it to the water line. So, if you drink a lot of coffee, you’ll need to refill the reservoir often. If you prefer using K-cups instead of freshly ground or pre-ground coffee, the K475 is the ideal machine for homes with three to four people living in it. But, if you’re looking for a coffee machine just for yourself, we suggest you look at other options from Keurig. For personal use, the Keurig K55 is the ideal choice. It costs less than $100 and it is an Amazon bestseller. With thousands of favorable customer ratings, this coffee maker is as popular as it is economical. The machine is easy to use, clean, and maintain. However, it is lacking in programmability. But, before we discuss the shortcomings, let us explore the benefits this machine offers. The K55 has a 48-ounce water reservoir and takes K-cup pod sizes 6, 8, and 10 ounces. It has a simple interface with button controls. The buttons allow you to brew K-cups of the required size, descale the machine, heat water, and pour hot water. It also has an auto-off function. But, unlike more expensive Keurig machines, the K55 does not have an auto-start function, temperature selection, and strength selection. So, you can’t expect much flexibility in your brews. However, this is a machine for personal use, and once you get used to the taste, you won’t have to tweak around with settings anyway. Considering the product’s price, popularity, and features, we think the K55 is a good choice for people who want to brew K-cup pods for themselves. If you’re planning to use the machine for three or more people, the K475 is the better choice because it lets you brew a carafe of coffee with K-carafe pods. The K15 is designed for portability. It’s compact and weighs just a pound. So, if you’re looking for a single serve K-cup pod coffee maker that you can carry along with you on your travels, the K15 is a superb choice. This mini coffee maker is also ideal for small kitchens where the counter and cabinet space is at a premium. The water reservoir on the K15 is large enough to prepare a single serve. You can choose between 6 ounces and 10 ounces. The removable drip tray also gives enough clearance for cups as tall as five inches tall. And, it has an auto-off function to save energy and prevent damage from overheating. The K15 is available in five different colors. The product’s strength is also its weakness, depending on what’s important to you. For instance, if you use the machine frequently, you should fill the reservoir before each use. This is rather annoying. The annoyance increases, even more, when you have to make coffee for more than one person. Although the machine costs less than $50, you should not buy the K15 for the price alone. You should consider the utility instead. As long as the benefits and limitations of the product align with your requirements, you will be happy with the K15. 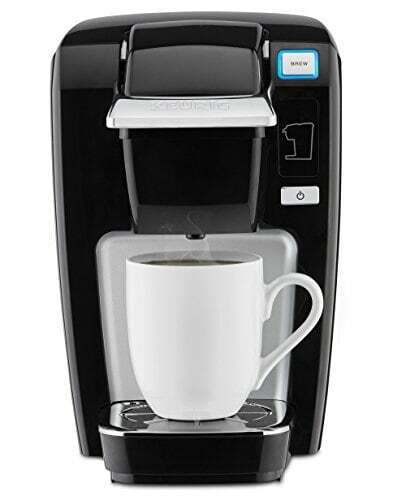 Like the K155, the Keurig K145 is a K-cup pod coffee maker for office use. By this, we mean that it is built for high-volume use. Think about this, a 30-person office would brew 60 to 90 cups of coffee every day. So, an office brewer experience in a day the same load that a home brewer experiences in a month. Naturally, an office brewer should be durable, fast, and efficient. And, that’s what the K145 is. The best part is that the K145 costs less than half as much as the K155 does. However, the K145 does not have the programmability of the K155. And, the K145 has a 48-ounce water reservoir, as opposed to the K155’s 90-ounce reservoir. You cannot program the temperature, start time, or stop time. Also, the interface on the K145 uses buttons, not a touchscreen display like the K155 does. In terms of raw functionality, the K145 and the K155 are on equal footing. However, the K155 is more sophisticated than the K145. The principal contention is between programmability and economy. If you value the economy of the K145 more than the auxiliary features of the K155, we suggest you take advantage of it. 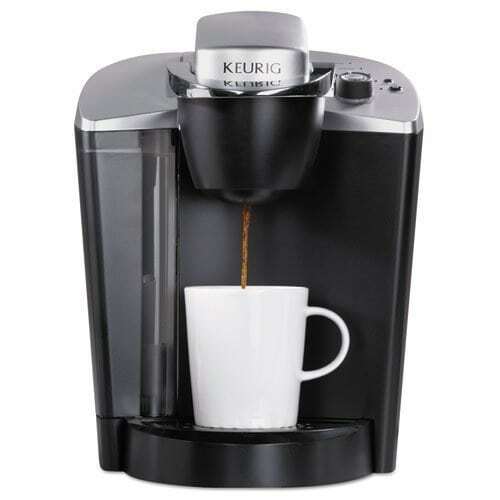 Keurig has many K-Cup pod coffee makers at different prices. They have different capabilities. So, a product that’s ideal in one situation may be terrible in another. In this section, we will help you properly align your requirements with the features of the product. To do this, first, we will look at the benefits and drawbacks of K-Cup pod coffee makers. Then, we’ll go through the important factors to consider when buying a Keurig brewer. Towards the end of the section, we will suggest notable models in the Keurig product line. After reading this section, you will be able to frame your requirements clearly and evaluate a product’s value based on objective considerations. This way, you will be sure that your money is spent in a way that benefits you the most. If you’re ready, let’s get started. Should I buy a K-Cup pod coffee maker? Keurig invented the K-Cup pod coffee maker in 1992 for office use. Since then the K-Cup system has become popular among home users as well. The system is popular because it prioritizes convenience, speed, variety, and low-maintenance. But, how does it fare against other ways of brewing coffee? Let’s see. Using a drip brewer is the simplest and the easiest way to brew a pot of coffee. But, with drip brewers, you should weigh the coffee to ensure consistency. With K-Cups, you can avoid this tedious step. Now, if you like drinking specialty drinks, such as espresso, latte, and cappuccino every day, you may need a semi-automatic or a super-automatic espresso brewer. These machines make better coffee than K-Cup pod coffee makers do. But, the pod system is significantly cheaper. And, among all machines, the K-Cup brewer is the easiest to use, clean, and maintain. Plus, Keurig alone offers 160+ flavors of K-Cups. And, most of the K-Cups cost less than a dollar per serve. In summary, if you appreciate speed, convenience, ease-of-use, economy, and variety, a K-Cup pod coffee maker is ideal for you. But, these machines come in different models, each offering different advantages and disadvantages. So, you should be aware of relevant points of comparison. What are the factors to consider when buying a Keurig K-Cup pod coffee maker? Speed: K-Cup pod coffee makers are single-serve machines. So, consider the number of cups you brew back-to-back. For example, if the employees in an office use the machine at the same time, let’s say during the 10 o’clock coffee break, the machine should brew an order quickly and be ready for the next order with very little downtime in between cups. Cup Size: Almost all Keurig coffee machines that use K-Cups allow at least three cup sizes. For example, 6, 8, and 10 ounces. A customary US cup measures 8 ounces. Changing the cup size also allows you to adjust the flavor. For instance, the flavor is at its boldest when you set the cup size to 6 ounces. If you increase the cup size, the flavor becomes less intense. But, this is a very crude way of adjusting the strength. Cup size also impacts the number of cups the machine can serve before running out of water. Water Reservoir Capacity: Water reservoir capacity is an important consideration. If you choose a coffee maker that has too small a water reservoir for your situation, you should fill the reservoir frequently. This is a pain. So, divide the water reservoir capacity with 8 to get the number of cups you can brew on a single fill. For example, the K155 has a 90-ounce water reservoir. So, this machine will make 11 cups before running out of water. Waterline Plumbable: Now, there’s a limit to the size of the water reservoir Keurig can put on a coffee maker. So, to cater to very high demands, Keurig offers machines, such as the K150, which you can plumb directly to a water line. This way, you will not have to worry about filling the reservoir. But, make sure that you have a good filtration system. Also, check whether the machine has an automatic decalcification cycle. Temperature Selection: By default, the brewing temperature in most Keurig machines is set at 192° F. But, some machines allow you to change the temperature. In our opinion, this feature is good to have. But, it is not a must. After all, if you’re sensitive to brewing temperatures, what you need is a PID controlled super-automatic and a $1000+ budget. Strength Selection: Earlier we mentioned that changing the cup size is a crude way of controlling strength. So, some machines offer ways to change the strength without changing the cup size. This feature is useful when you frequently change the variety of K-Cups, or when many people, all with different preferences, use the machine. For an office environment, strength selection is a useful feature to have. Interface: Keurig interfaces are easy to use. But, they vary in sophistication. In high-end models, you get LCD touchscreen displays. On cheaper models, you get no display, only buttons. This is a matter of sophistication, not function. So, this is a nice way to splurge. That said, an LCD display is extremely useful if you love a machine with good programmability. Auto-Off: Since coffee makers have a heating element, it consumes a lot of power. The auto-off function saves energy by turning the machine off after a pre-set time from the last use. This can be as short as a minute or as long as a couple of hours. Almost all coffee machines have this feature. But, the extent of programmability varies. Auto-On: This is the opposite of the auto-off feature. This function allows you to program the machine to brew a cup of coffee at a predetermined time. For example, if you want a fresh cup of coffee right after you wake up, you can set the machine to brew a cup ten minutes before your wake-up time. But, make sure you put the K-Cup. Otherwise, you’ll get just hot water. Okay, if I’m buying a Keurig coffee maker, what are my choices? If you’re looking for a cheap K-Cup pod coffee brewer, the K55 is your best option. But, if you want a commercial machine with great programmability, buy the K155. If you’re not big on programmability, but you still want a commercial machine, consider getting the K145. And, if you want to use K-Carafe pods to brew a 30-ounce pot, the K475 will suit your needs perfectly. Lastly, for people looking for a compact, lightweight, and portable model, you can’t go wrong with the K15. In addition to these models, Keurig offers many other products. So, if you want to explore your options further, be sure to check their full product line. If budget is not a constraint and you want the best product, then the Keurig K155 is the best option. But, based on our reviews of Keurig coffee makers, you know that certain products outshine the K155 in certain situations. For example, the K475 can brew a 30-ounce pot of coffee. So, the K475 is better than the K155 when it comes to brewing coffee for the whole family. Another example is the compact K15. If you prize portability, then no other Keurig machine beats the K15. And, if you’re looking for a balance between price and functionality, the K55 is a great choice. So, no matter what your requirements are, there’s a Keurig machine that’s right for your needs.